Students enjoyed practicing keeping their hearts healthy. The American Heart Association estimates that they saved almost a hundred lives through their efforts. Thanks to all and have a great break. In two weeks students will put their heart health to the test during our Kid’s Heart Challenge event during class on April 9th,11th &12th. We will be focused on keeping our hearts healthy by remembering to drink water instead of sugary drinks and eating fruits and veggies instead of foods high in sodium. We also played a game that will remind us not to start using tobacco or e-cigarettes. Finally students worked in teams to practice long-rope jumping. This really got our hearts and our teamwork pumping. Please, ask your child about their class. The teamwork in the gym was striking to behold. In the first video you will notice student teams engaged in a mixture of non traditional and traditional exercises. This month stusdent teams have created their own exercise circuits. Teams were given a target area of the body and they had to create a repeatable pattern that would exercise that area of the body. This particular class invented Starlifts (full body/cardio). Energy Core(middle body), Leg Kickers(lower body), and Upper Bridges(upper body). The second video shows a fourth grade class using striking patterns to achieve a goal they set for themselves. Please, ask your child about their class. Students used striking patterns this week to practice teamwork. 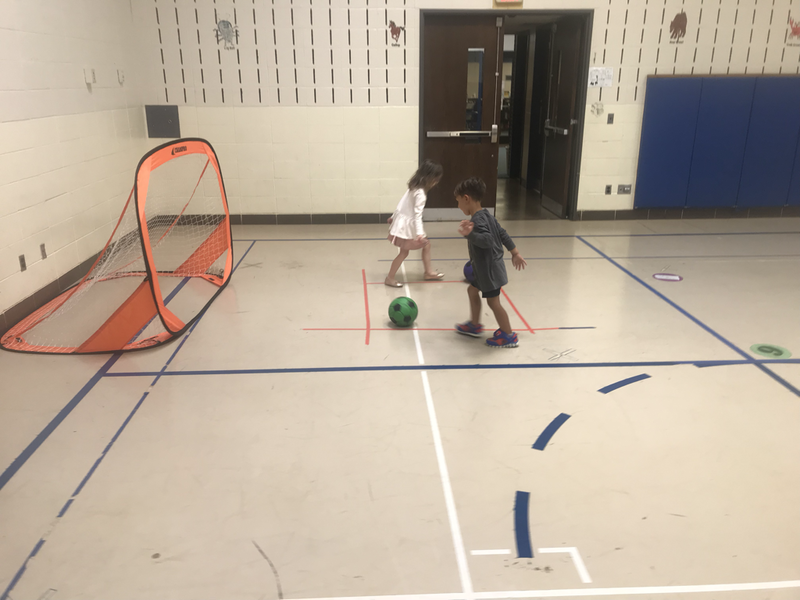 Younger grades did partner work and then applied their striking patterns during a game called hand soccer. 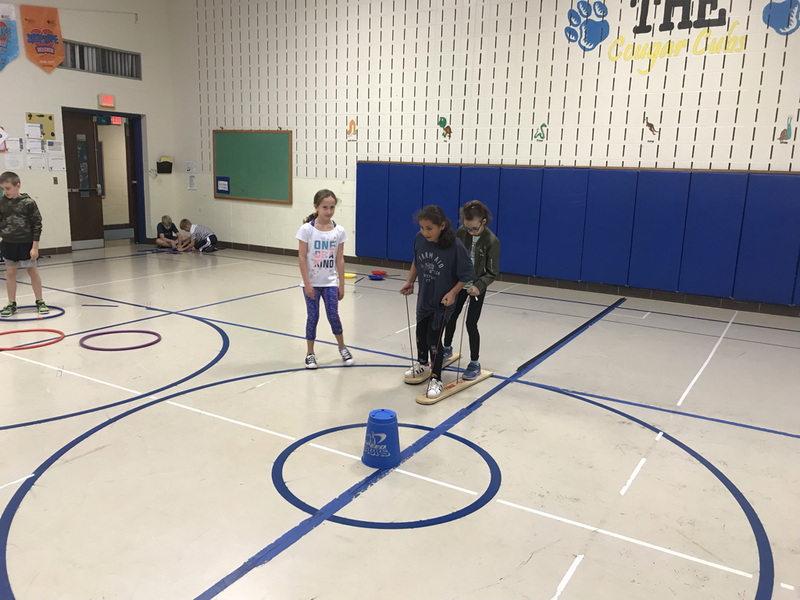 Upper grades worked on positioning and teamwork during a game called Blob Sttike. Students at all levels impressed me with their ability to work together. Please, ask them about their class. Students explored the value of teamwork this week by participating in a modified Iditarod. The students realized how much easier it is to reach their objective when they work as a team. Students also discussed the importance being a safe teammate and how that makes the team better. Please, ask your child about their class. As a culminating activity this week students are applying their basketball skills in a game called Trophies(video). Students need to access the patterns they practiced in a dynamic environment. This will become one of our anchor games for the rest of the year. Please, ask you child about their class. Students’ dribbling, shooting and passing skills are developing. More importantly, students’ ability to work together as a team is strong. This week we applied our skills in a variety of ways. Fourth grade played a version of full court basketball. Middle grades played a game called Give and Go(video) and Kindergarten played a dribbling version of Mr. Fox. Please, ask them about their class. Students continued to develop their basketball related patterns this week. 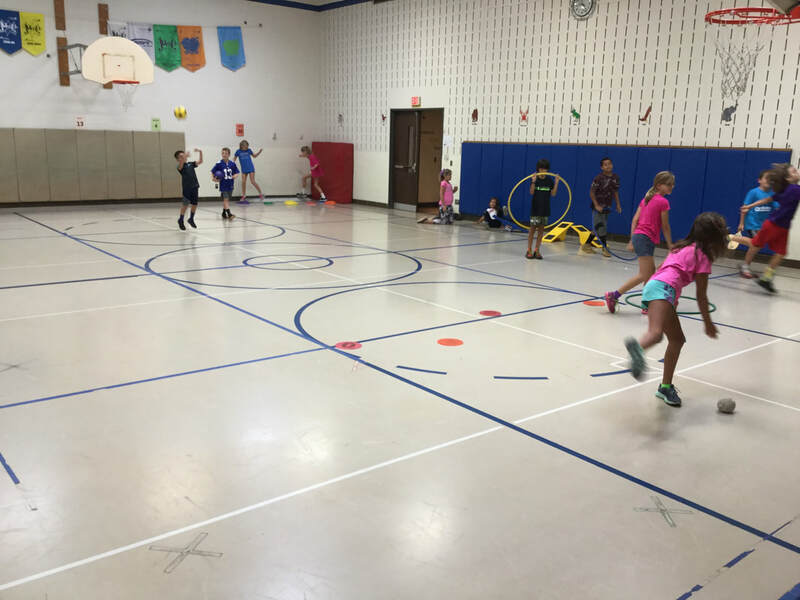 Students practiced dribbling and shooting patterns in hopes of further developing them and making them permanent. The first video is a dribbling game in which students must dynamically maneuver through shard space, while dribbling a basketball at different levels. They were tasked with delivering Valentines to other teams while maintaining control of the ball. Upper grade students had their choice of applying their shooting patterns in either Knockout or Make-It-Take-It. Lower grades worked on dribbling and shooting patterns in a less dynamic setting. Please, ask your child about their class. Students will be working with basketball related patterns over the next few weeks. Staying in an athletic position and controlling the ball are important to a mature dribbling pattern. You can see the development from Kindergarten to fourth grade in the videos. Please, ask your child about their class. Students were able to enjoy adjusting their kicking and throwing patterns with footballs. In the video you can see the students using a kicking pattern to play Field Goal Frenzy. The second video shows students using throwing, catching and defense patterns to play Footseball. All students are ready for the Super Bowl. Please, ask your child about their class. The beginning of a new year is a great time to set goals. Over the next few weeks students will be working on setting short term and long term fitness goals. We will use the PACER in all grades to apply our short and long term goals. It has been about 15 weeks since our last PACER. This is a great time for students to assess any changes to their aerobic capacity over that time and plan for their future fitness. Please, ask them about their class. This week students worked really hard so they could get next week off. We enjoyed eachother's company while employing the strategies, motor patterns and sportsmanship we have practiced this school year. Have a restful break and please ask you child about their class. Students may need to ask for bigger hats for holidays as their brains may not fit in their old ones any more. Students did a great job of further developing their patterns in a varitey of ways. You can see teamwork, hustle and encouragement on display in the video. Please, ask them about their class. Students have continued to use their bodies to teach their brains. We have been focusing on building creative structures that will engage our "Specials" hemisphere of our brain. Students worked individually and in groups to create and duplicate a variety of intricate structures. We also worked with some timed stacking patterns which allowed students to gauge their progress and further develop their non-dominant hand. Please, ask them about their class. This week students focused on building their brains. We took a look inside the human brain and discussed its functions and responsibilities. Students will be building their bodies and brains by performing exercises in which they need to move trans-laterally and cross the midline of their bodies. Students will also continue to work to build muscle-memory and bi-lateral integration. 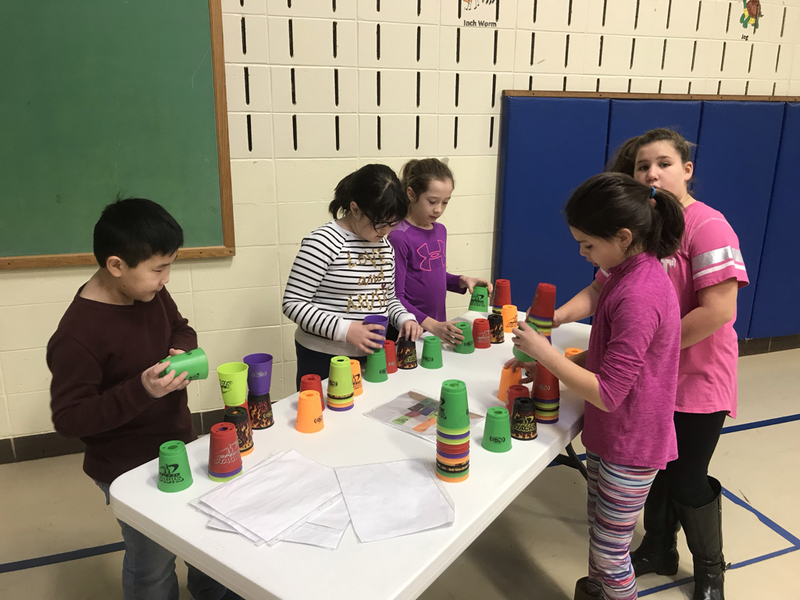 Students understand that their brains learn through patterning they will use stacking cups to perform a varitey of patterns. See if you can detect any patterns in the video. Students will be more excited the next time their brain feels confused because they know that is part of learning. Please, ask them about their class. Students got a Thanksgiving Day treat this week. They were able to impress our turkeys with their muscular endurance, exercise skills and creativity (video). Older grades explored nutrition labels and all students reflected on the importance of powering our bodies with healthy foods. Have a Happy Thanksgiving!!! We are further developing a variety of skills in the gym this week. You can see in the video Kindergarteners practicing catching, throwing, balancing and jumping. We also worked on strengthening our core and exhibiting the character traits of good teammates. Please, ask them about their class. We are getting a spooktackular workout in the gym this week. Students are putting their skill patterns to the test during activity relays and games like Ghost Hunter (high target) and Pumpkin Patch (low target). We have to work off all that candy somehow. Please, ask your child about their class. Students are just kicking it this week. We have been modifying our kicking patterns. Older grades focused on striking the ball with their feet while on a skooter, while playing scooter soccer. Younger grades had to focus while modifying their patterns to kick smaller balls during a game called Goalies. 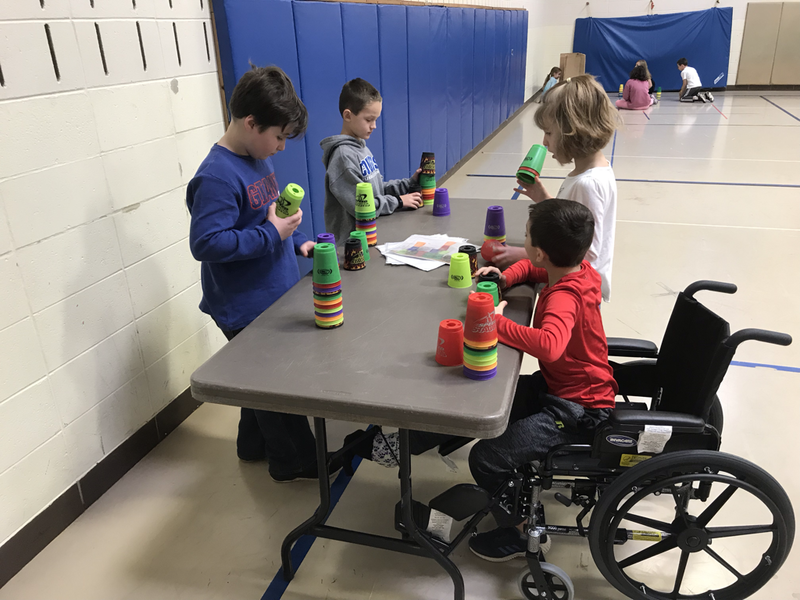 Each class exhibited teamwork, hustle and encouragement while playing the games. Please, ask them about their class. Students are working on a variety of patterns during P.E. this week. Station work this week required students to balance, toss, jump, catch, strike and use fine motor skills as well. In the pictures you can see students using teamwork. The video captures a Kindergarter developing her rope jumping skills. Notice she distinguishes between her swing of the rope and her jump over it. Please, ask you child about their class. Encouragement is a pattern that is becoming permanent in the gym. 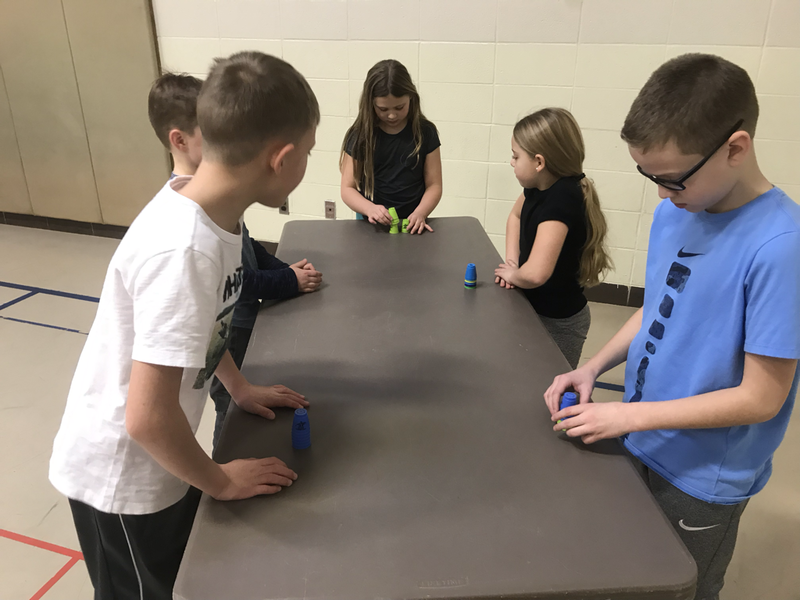 Students at all levels played team games this week. Students know that if they practice being a good teammate and working hard they will encourage their classmates. The games we played reinforced those patterns as well as striking with their feet. Please, ask them about their class. This week students are working on controlling a manipulative with their feet. Younger students are exploring how to tap and kick a ball with differnt parts of their feet. Older students are working on controlling a ball with their feet while changing directions and speeds. Students had the opportunity to be good partners and teammates this week as well. Even though their target may change (self, partner, goal) they know if the they practice the pattern they will be more successful. Please, ask them about their class. Weak=Strong. This week students are exploring the concept of making their bodies weak so they will become stronger. We discussed how at the end of a workout we feel weaker than when we started. The above photos are of some students performing some exercise patterns and taking the PACER this week. The PACER is an endurance run designed to make us find the point at which we become tired and weak. Students are now on the lookout for the strength that comes from making our heart. lungs, and muscles work that hard. Please, ask them about their class. 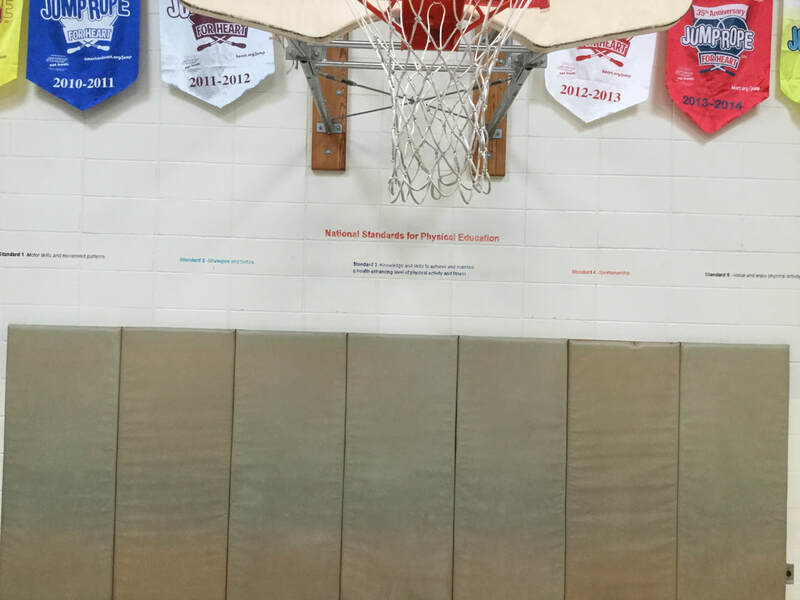 This is a picture of National Physical Education Standards printed on the wall of the gym. They are prominently displayed because these 5 overarching concepts set the purpose for everything we do in the gym. At the beginning of each class we discuss the standards and skills we will be focusing on for the day. The goal of these National Physical Education Standards are to develop us into physically literate individuals who have the knowledge, skills and confidence to enjoy a lifetime of healthful physical activity. The first few weeks will have focused on Standard 1 which focuses on motor skills and movement patterns. The patterns and skills taught and practiced in class are ones that are utilized in the games played out at recess. 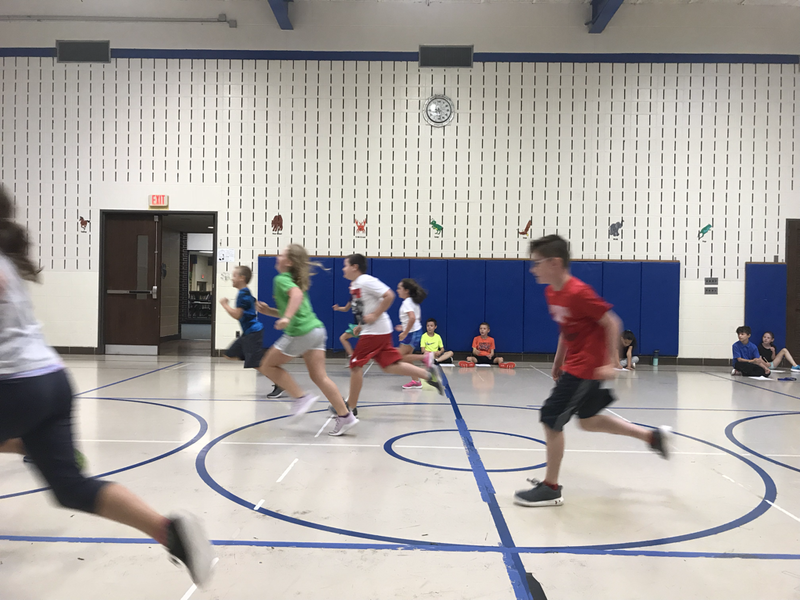 Students have worked on kicking, striking, dodging, and throwing so they can feel more confident when joining one of the many games of GaGa, kickball, or four square played outside. We will also work on teamwork Below is a video of Kindergarten sharing space and working together. We are having a fantastic start to the new year. Please, ask your child about their class. What an amazing Field Day we had. 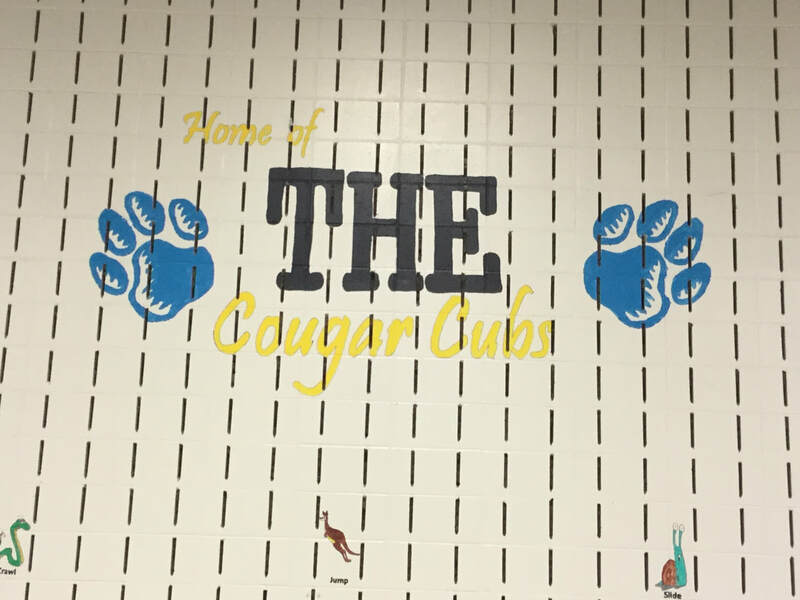 I believe the fun was with us that day and the students did a great job of using teamwork, hustle and encouragement to be the best Cougar Cubs they could be. I personally want to thank the teachers and staff for being so flexible due to the weather, the PTO for the fantastic skating assembly and the students for making sure everything was safe and fun. Special thanks go out to Danielle Tabaka, Brian Conte, Steven Wrinn, ​Lisa Hollman, Maggie Nablo, Laura Melanson,Veronica and Anthony Pizzorusso, Kathryn Bratzner, Karen Therrien, Tiffany McCauley, Karyn Felder, Alli Behnke, Dave Saraceno, Jenn and Sal LoGuidice, Dan Moriarty, Kara and Greg Sanderson, Jenessa Cretella, Ella and Paul Demaio, Rob Harlow, Mark Peryga, Jamie Sciacia, Lisa Van Zilen, Adrianna Schull, Denise Lamountad, Jennifer Favolora and Ed Miller for all their help in making the day possible. Can't wait until next Field Day. May The Fun Be With Us next Friday for Field Day. We continue to practice our patterns and our teamwork, hustle, and encouragement. Below is a video of 4th grade practicing for the Limbo contest on Field Day. Notice the body control, balance, and varying strategies the students employ to meet their goal of getting under the bar without touching it. Great work by all!!! The Cougar Cubs are continuing to prepare for Field Day this week. We have been working together as a team in a variety of ways. We learned and played a game called Destroy the Deathstar. Dancing is also a way we can be a team and stay fit. Below is a video of one of the songs we have been busting moves to. See if you can do it with your child. This week students are exercising their bodies as well as their technology skills. The video shows some third grade students getting some encouraging exercise messages from the fourth graders. 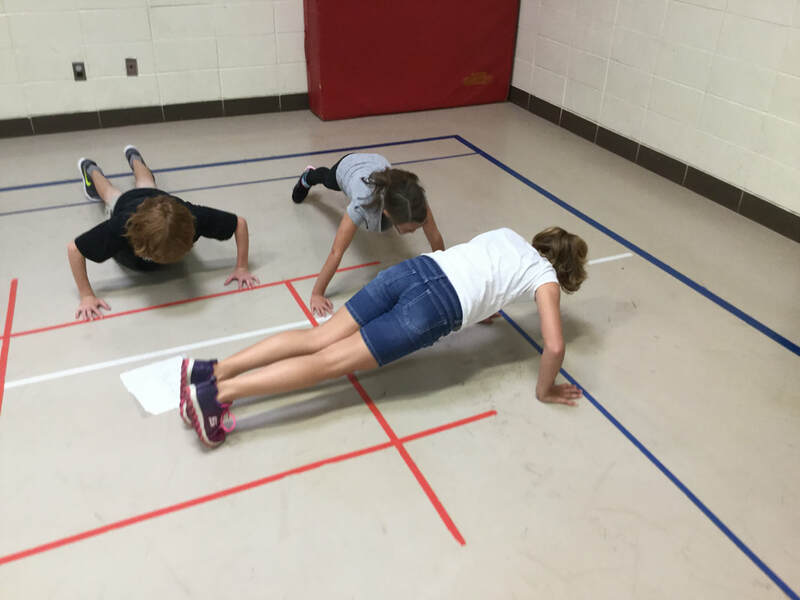 Fourth grade teams created repeatable exercise patterns and demonstrated them on video. Classes this week used the ipads learn, execut and enjoy the exercises they were taught. We also began practicing some new Field Day games that we will use during our May The Fun Be With You field day. Please, ask you child about their class. Spring is in the air. This week students will be revisiting outdoor games during P.E. class. In the video you can see the fourth graders perfecting their kicking patterns to take on the faculty during the Field Day Kickball game. Field Day will be Friday, June 1st with a Wednesday, June 6th rain date. It will have a Star Wars theme this year and all students will learn how to use the fun that day. If you wish to volunteer to help out on Field Day please contact me at tbergantino@rsd17.org. Please, ask your child about their class. Students are celebrating their heart health. The following are some videos of a fourth grade class engaging in some heart healthy activity in the gym. The second video is of a a Kindergarten class. One if the thngs that make this week so special is when the fourth graders and Student Council members share their time, talents and knowledge with the younger students. Thye do an amazing job and have fun while teaching. Please, ask them about their class. We are preparing for Jumpe Rope For Heart this week. The first video is of a game we are playing to remind of us ways to prevent heart disease from popping up. If a student gets struck by a popper they must explain one way they will keep their hearts' healthy. Some common responses I heard were to make half of what they eat to be fruits and vegetbles, get 60 minutes of ecercise each day, stay away from sugary drinks and foods high in sodium, and avoid tabacco. The next video shows students working together to stay heart healthy by jumping the long rope. It is great to see the turners and jumpers really being a team and exhibiting the cues we went over during class. Please, ask them about their class. This was an eggciting week in the gym. Students got plenty of eggcersize by doing some egg trading while engaged in a variety of movement patterns (video 1). We got plenty of eggtivity playing a game called the Grinch Who Stole Easter (video 2). Students practiced throwing a ball toward a target while using an arc. An eggcelent job was done by all. Please, ask them about their class. We are preparing for Jump Rope For Heart. This week we talked about how to maintain a healthy heart. Students now know that getting exercise, eating a variety of fruits and vegetables and drinking lots of water will help them to keep their heart healthy. Students also know that they should stay away from sugary drinks, too much salt, and tabacco. Most importantly, we learned that we can choose to help others by making choices to keep our hearts healthy! Jump Rope For Heart will take place April 10th, 12th, and 13th during P.E. Class. This week the student looked inside their bodies and checked their cardio health. 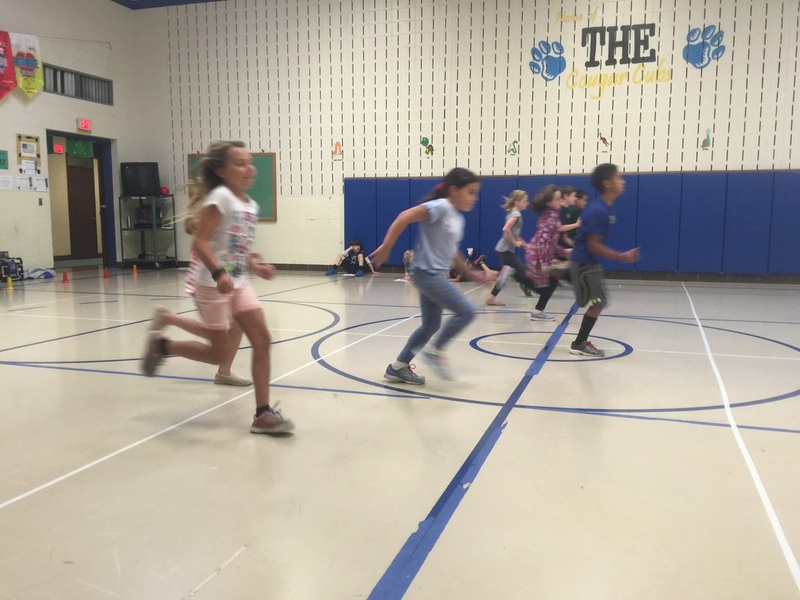 We use the PACER to set cardio goals and see if we are maintaining or increasing our aerobic capacity. Please, ask your child about their class. Happy Holidays! This week the students worked on a variety of skills this week. 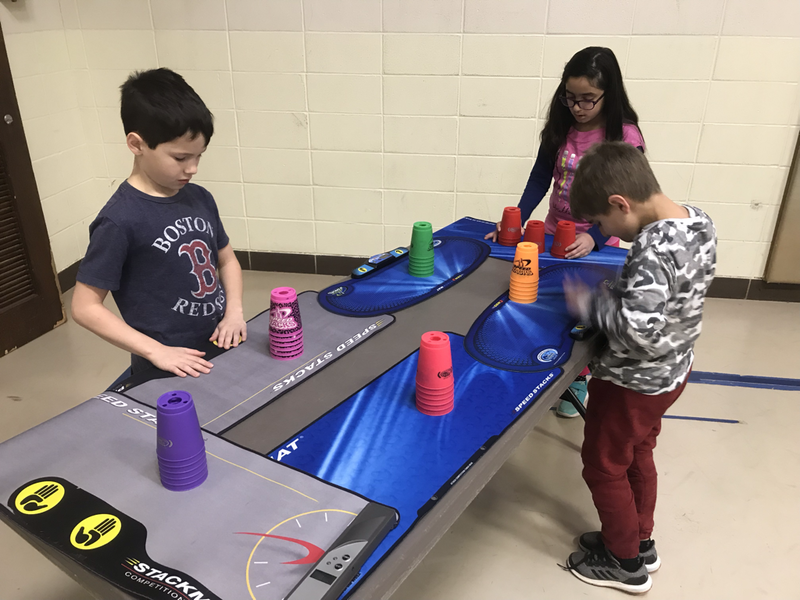 Patterning, bilateral integration, hand-eye coordination, teamwork, strategizing, and cardio are a stations the students enjoyed. Please, ask them about their class and have a great holiday break! Students continued to work on patterning with the cups this week. In the video you will see some stacking station work. The students are working on their six-stack pattern, copying structures, stack relays and free builds. Please, ask them about their class. Students have improved their patterning with their non-dominant hand this week. We know that when we work with the cups we are focusing on strengthening our brain. However, it doesn't mean we can't get a good cardio workout in the process. Please, ask them about their class. This week students focused on building their brains. Students will be building their bodies and brains by performing exercises in which they need to move trans-laterally and cross the midline of their bodies. Students will also continue to work to build muscle-memory and bi-lateral integration. 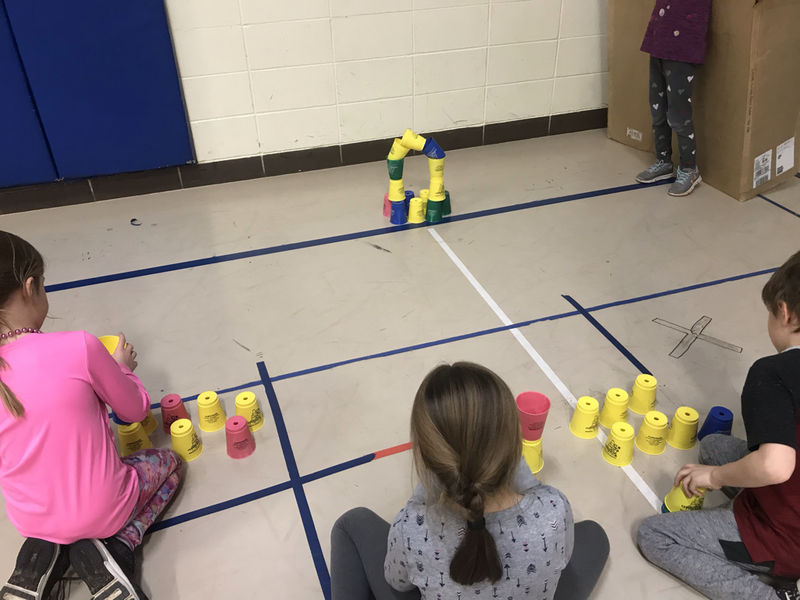 Students understand that their brains learn through patterning so upper-grade students will use stacking cups to perform a varitey of patterns. PK-1 will explore with the cups by building creative structures. Please, ask them about their class. I am very thankful for the opportunity to attend the CTAHPERD Fall Conference Thursday and Friday. I learned some ways to keep the students healthy and active! The students that I have seen over the past few weeks prepared themselves for Thanksgiving Day by reflecting on how thankful they are for their healthy bodies. Grades 3&4 discussed the importance of having stategic goals and balancing healthy diet and exercise. K-2 worked on exploring what makes up a healthy diet and exercise by teaching some of our turkey friends in during class. Please ask your children what they learned and have a fantastic holiday! This week we worked on a variety of skills. The first video is of Kindergarteners training their ghosts(yarn ball inside of a shopping bag). The bags slow down the ball and allow the students more time to react to the ball. You can see in the video that students do an excellent job tracking the ghost with their eyes and prepare their hands for the catch before the ghost comes. Great job K friends! The second game is an anchor game called Pumpkin Patch. An anchor game is a game that is accessible to all grade levels and employs multiple motor skills. 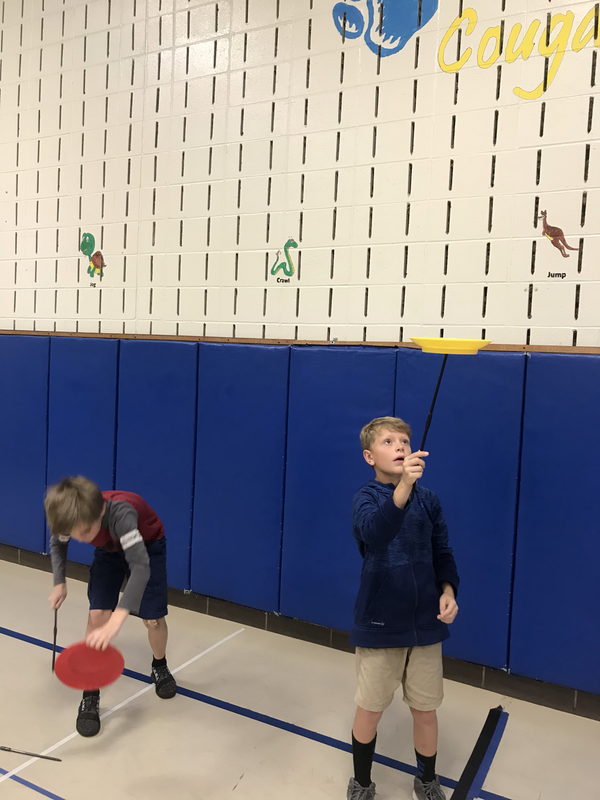 Students engage in cardio, striking, throwing, kicking, aiming, catching and dodging skills while also exhibiting teamwork, hustle and encouragement. Count how many skills you see the students working on. Happy Holloween. We are continuing to work on striking a ball with our feet. You may hear your children saying "our goal is control" in their sleep. Don't worry, they learned in P. E. class. Students are working on making sure they can control a ball with their feet while moving through space. In the videos you will see a progression. 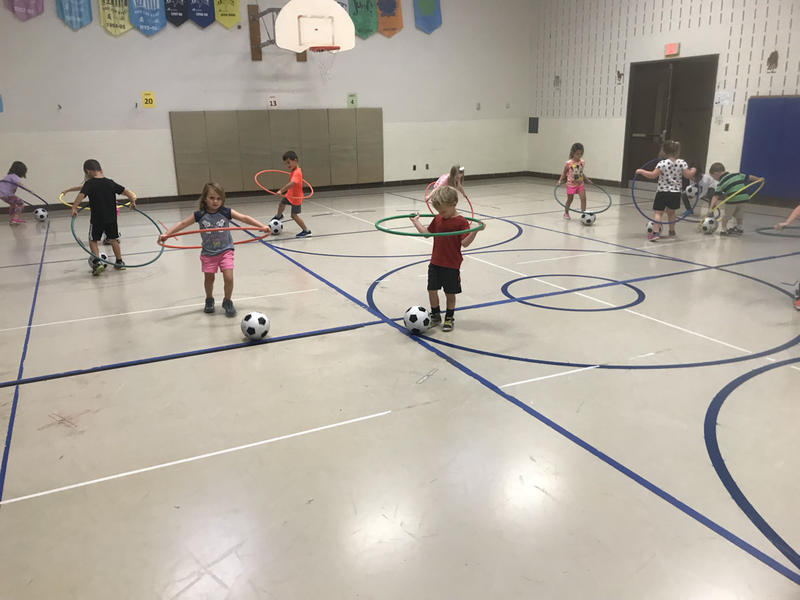 Pre-K students use a hula hoop to help them decide if they are keeping the ball in control. 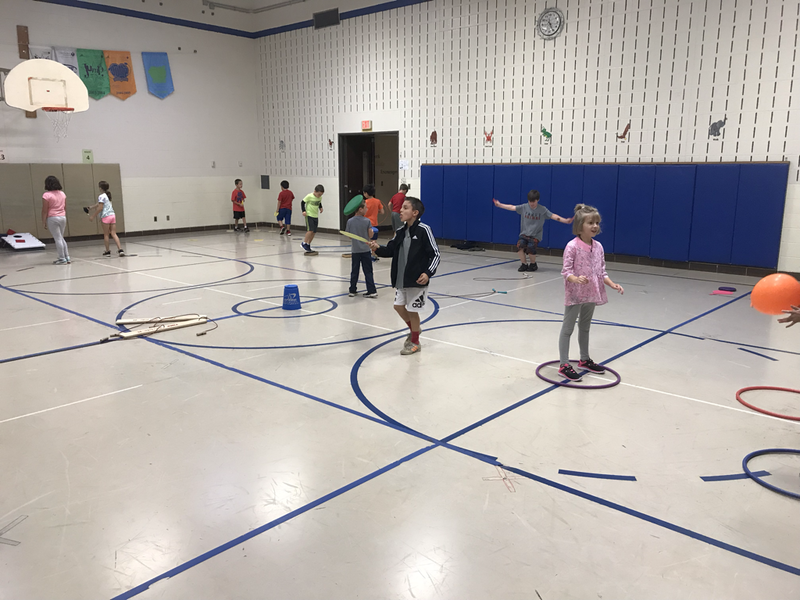 Kindergarten classes are using an imaginary hoop to help them vizualize control and if fourth grader allows their ball to get too far away a defender can come over and tag it and they are out of the game until a teammate comes to their aid by sending the ball between their feet. Same basic skill, three different levels of development. This week we are kicking it! 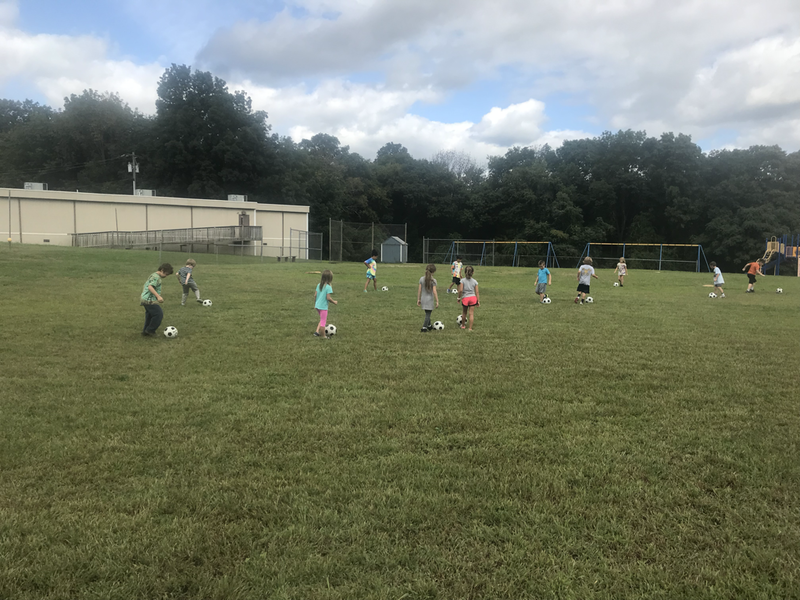 Students are exploring kicking a ball for different purposes. Some targets we have been kicking toward are on the ground and some are in the air. Sometimes we kick to keep the ball away from a person and sometimes we kick it to someone. Students worked on setting a purpose for their kick and then decided the best way to adjust their kicking pattern to acheive it. Nice Job! Station Day! You can see a fourth grade class working during class this week. Balancing, throwingand jumping are a few of the skills students performed. Older students were able to watch their push-up patterns on video and younger grades got to watch themselves perform some sweet dance moves. Students also exhibited Teamwork, Hustle and Encouragement to their partner as they worked their way through all 12 stations. Warming up is an important part of P.E. class. In the pictures you will see students engaging their muscles, heart and lungs through locomotor patterns. 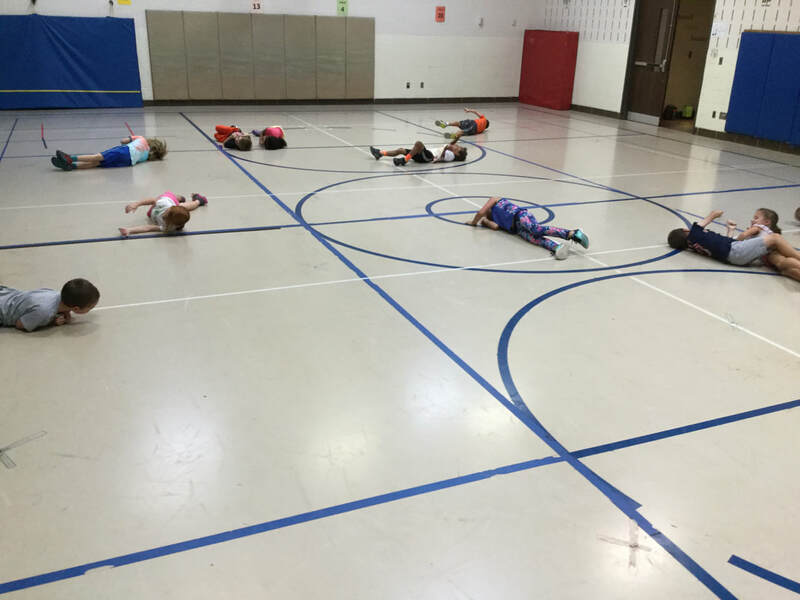 You see first graders performing a log roll. This is a great core work out and is one of the movement patterns they use at the beginning of class to warm up their bodies and share space. 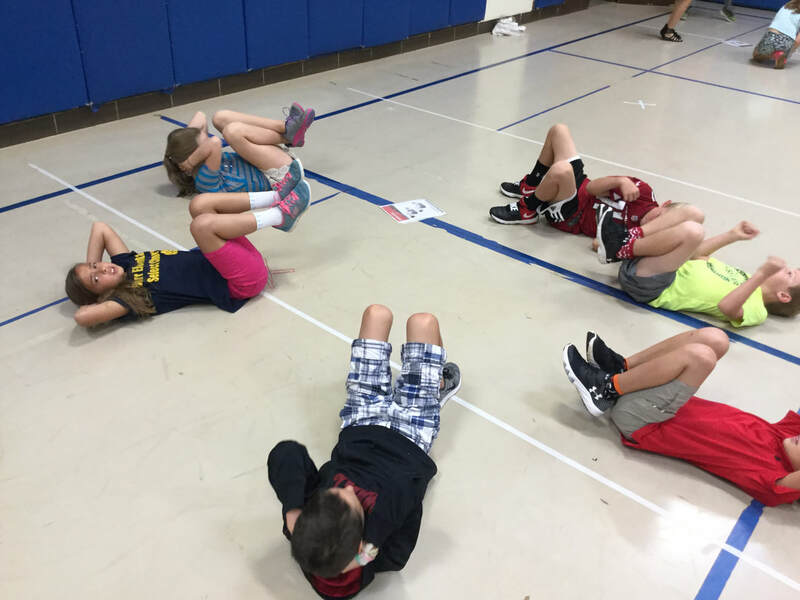 Fourth grade can be seen circuit training at the beginning of class as a warm-up. 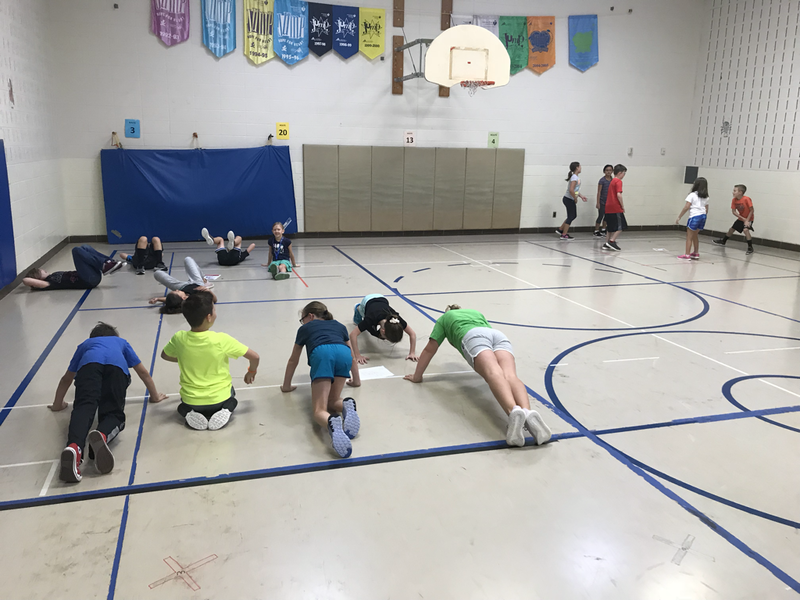 Students are working their core doing crunchers and practicing right angle push-ups in preparation for the Connecticut Physical Fitness Test. 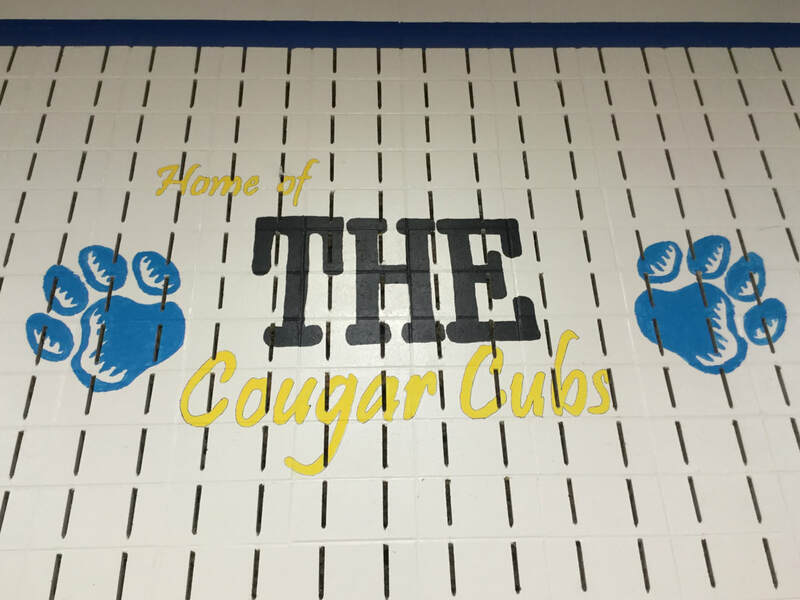 We are THE Cougar Cubs!!! THE is an acronym in the gym. The T stands for teamwork, H for hustle, and E for encouragement. In our community we know that if we displayed these three characteristics during class we are winners. In older grades we all get an opportunity to be a team leader and we really get to practice these character traits. As we know practice makes permanent. What an amazing day! We could not ask for better weather in which to be active. I want to thank our Sensei helpers: Doug Burt, Dave Saraceno, Lizzandra Rivera, Dave Lammare, Danielle Tabaka, Jenessa Cretella, Laura Napierkowski, Salvatore LoGuidice, Laura Melanson, Anthony Pizzorusso, Maggie Nablo, Connor O'Rourke, Alli Behnke, Lisa Hollman, Rachel English, Amy McLaughlin and Jennifer Tassmer. They did a fantastic job of getting the kids active and sharing in the students' enthusiasm. Also, thank you to Jen Favalora for coordinating and taking pictures of the kids so they could enjoy seeing themselves Ninjaing it up. Thanks to our water balloon engineers: Mr and Mrs Lamuntad and Mrs. Engler, Mr, Miller, Mrs. Therrien for being floating helpers. Thanks also to the PTO for arranging for the Real Life Ninja Warior, Drew Dressel, to come and speak to the kids about getting back up after you fall down. Field Day T-shirts were fantastic again thanks to Jen LoGuidice and a special thanks goes out to the Cafeteria staff for creating a magnificent lunch for all of us to enjoy. The Staff and the students here at Burr District Elementary are something special and were models of Teamwork, Hustle, and Encouragement on Field Day and every day. Thanks again to all who helped in any way it is appreciated.